The article presents a simple LED indicator timer circuit which can be used with board games for indicating the elapsed time or the time consumed by the player to complete his or her turn. The idea was requested by Mr. Shane Robins. 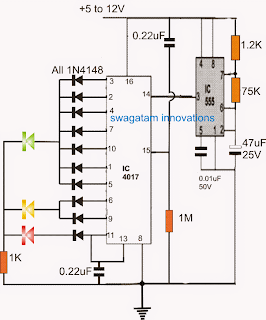 The proposed LED timer indicator circuit can be implemented with the help of the following simple circuit idea. This configuration has been employed in many different circuit applications so far in this blog, and it seems to be pretty versatile with its range. The IC 555 is a configured as an astable circuit for generating approximately 2.5 second ON/OFF duty cycle, which is fed to the clock input of the IC 4017 pin#14. In response to every positive or ON cycle edge of the 555 output, the IC 4017 outputs jump with a positive logic from one output pin to the next one in sequence, starting from pin#1 until pin#11. This implies that initially pin#3 is high, then after a clock cycle of 2.5 + 2.5 second ON+OFF time, the logic high from pin#3 jumps to pin#2, and so on until pin#11 is reached. In the diagram pin#3 to pin#5 can be seen joined and terminated to a green LED, which ensures that as long as the logic high is jumping across these pinouts, the green LED stays switched ON, and since the total time taken for the logic high for crossing these pinouts 5 x 7 = 35 seconds, the green LED remains ON for this period of time, as requested by the user. Once the above time frame is elapsed, the green LED shuts off, and the yellow LED illuminates, the logic high now travels across the pin number 6 and 9, and quietly identically keeps the yellow LED switched ON for 5 x 2 = 10 seconds. Finally, the logic jumps to pin#11 of the IC, shutting off the yellow LED, and illuminating the red LED. However since the pin#11 is also connected with pin#13, latches the IC into this position permanently. In this position the IC stops responding to the clocks fed by the IC 555, and the red LED stays locked and illuminated in this position until the power is switched OFF and switched ON again. 0 Response to "LED Timer Indicator Circuit"